I drove down to Providence, RI recently to go to Paper Connection International. My primary goal was to get paper for a series of scrolls with quotes from Emily Dickinson. I'll share more about that later when I get to the work itself. In addition to a great selection of papers, Lauren also has paper treasures from Japan that she sells through Papernado. I couldn't resist these two calendars—one to hang on the wall and one for my desk. 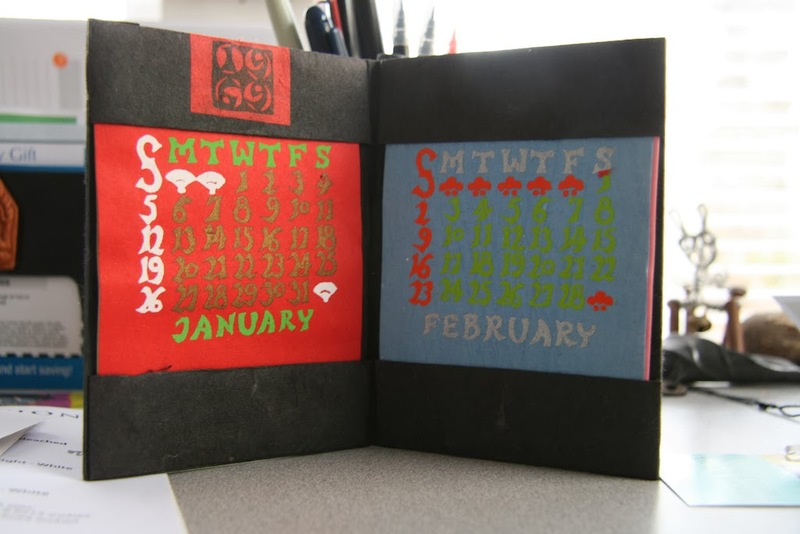 The hanging calendar is woodblock prints on handmade paper. February's saying is "Don't worry, be happy" from Saneatsu Mushanokoji, novelist. The desk calendar, from 1969, is proof that that goes around, comes around again. The days match up again now in 2014. It is printed with stencils. Lauren believes it was made by an apprentice of the Japanese textile designer Keisuke Serizawa. He was one of Japan's National Living Treasures. You can purchase the calendars here. Lauren has a blog, Where is Paperwoman? and always posts cool paper-related things on the Paper Connection facebook.